The moment I laid eyes on the restaurant I realised that it was not going to be love at first sight. The restaurant looks basic; in fact it feels bare, not much smarter than a posh office canteen. Its dress sense is bland, a combination of blue and white. The tables are small and the room felt tight, the tightness accentuated all the more by the number of people in the fully occupied restaurant. My friend proposed the use of the word ‘cosy’ until I put it to him that if I were to move an inch backwards in my chair, I would end up on top of the lady sitting behind me. The tables were covered with white linen tablecloths and overlaid with disposable paper ones, a practice I found unusual at a one-star-Michelin restaurant. My friend suggested that the décor did not matter, but I felt cheated. I had wanted the object of my desire to be well dressed. The food, my first love, was therefore the restaurant’s only remaining seduction ploy. But unfortunately, seduce it did not. The food was good, but not good enough and at the end of my session of romance I was left not quite satisfied. 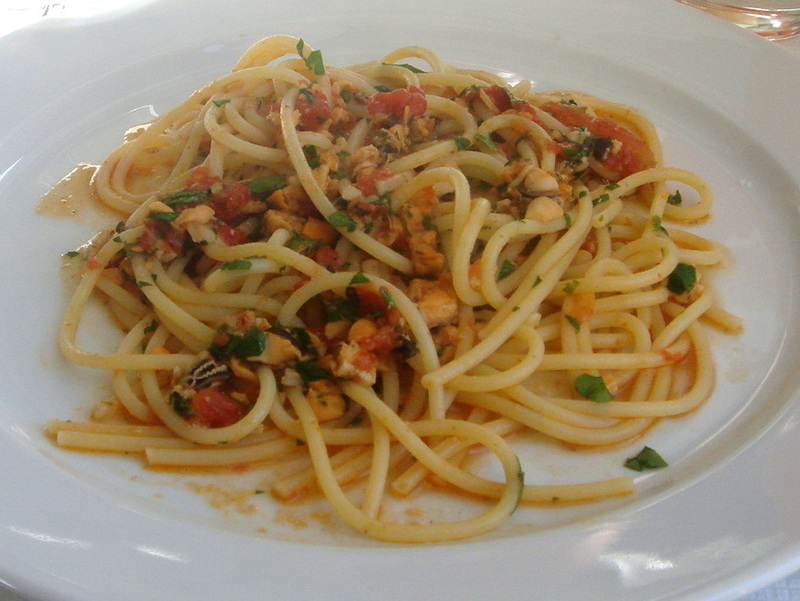 A starter of spaghetti con cozze della Marche (mussels, chilli, tomato, il Bacco Verdicchio (white wine) and wild oregano) was lovely, flavoursome and rich, with a fresh sea flavour from the mussels, but did not tantalise. 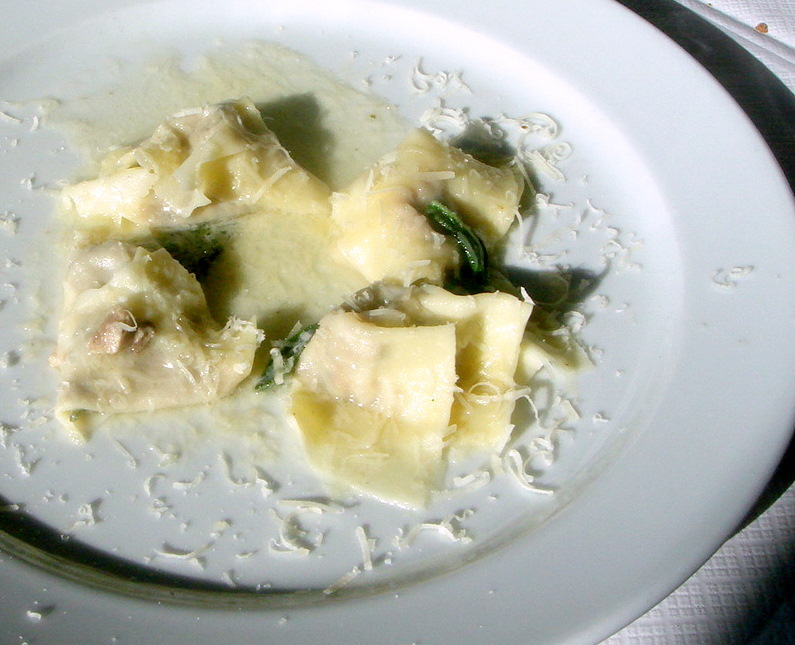 Anoli con coniglio, a dish of handmade pasta was stuffed with a lovely, tender rabbit slow-roasted with juniper, pancetta, thyme and white wine. Finished with an aromatic sage butter, it would have made for a handsome dish, if not for the fact that the handmade pasta had been overcooked, rendering it slightly soggy and leaving it with a texture of a wonton rather than the al dente pasta that one would expect from a Michelin restaurant. However at the table next to us, the same dish looked pert, alive and far more appetising, which suggested consistency and quality control issues in the kitchen. There appeared to be no sign of Rose Gray hovering and checking over each dish before it was sent out as alluded to in Marina O’Loughlin’s review in November 2008. After a disastrous fire in April 2008, the River Café closed for six months to re-open again late last year after a £2m refit. Perhaps as the grand re-opening has now passed, the time to try and impress the restaurant critics has passed too. 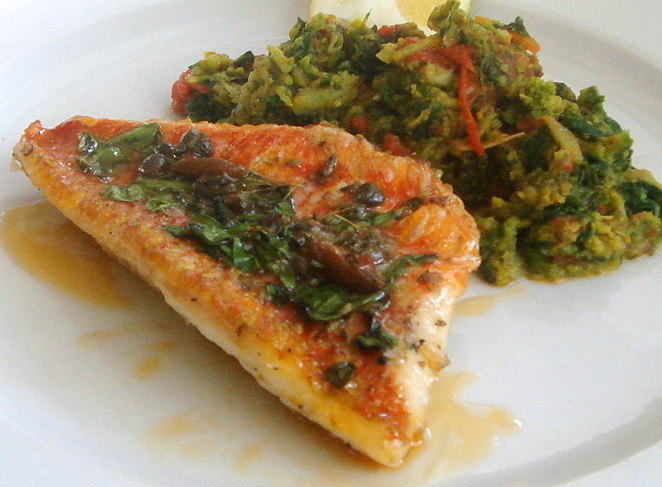 A main dish of red mullet (triglia al forna) was enchantingly delectable. Wood-roasted with a perfectly balanced mix of olives, capers, marjoram and lemon, it left an ecstatic sensation on my tongue. 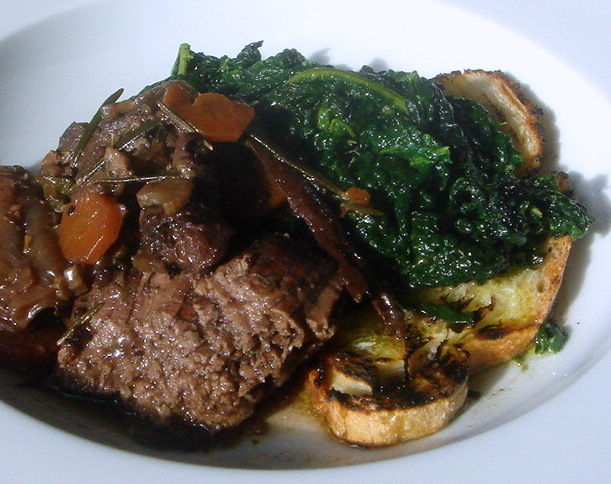 However, a beef braised in Alberto Longo ‘Capopost’ (red wine) with Vecchia Romana (brandy), bay, rosemary and cinnamon did not hit the high notes. While it was richly robust with flavour and reasonably tender, it was not as tender as it could have been. Furthermore, it was slightly dry. 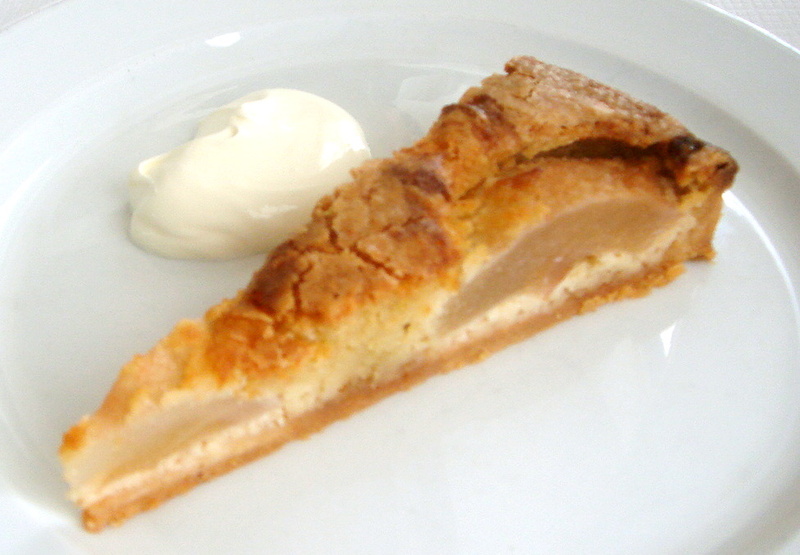 A pear and almond tart was light and tasty and helped to round off the meal. The wine list has an Italian focus and offers up some reasonably priced options. Service was efficient and unassuming, and all said and done, the special lunchtime menu at £24 was a very reasonable price for the three courses and the high quality of the produce we received. The combinations of ingredients were well put together with some lovely flavours. But my main disappointment stemmed from the fact that the cooking was far from perfect. Furthermore, there were no dishes that induced the gasps of awe that I had hoped for. So while the special lunchtime menu makes for a decent business lunch, given some of the errors, I simply couldn’t reconcile the meal I had to being Michelin worthy. My friend asked if I would go again for dinner and I could only respond with uncertainty. But perhaps it would be unfair to taint my perception of what dinner at the River Café would be like from just one lunch sitting, and so the only way to find out would be to go once more. The set lunch menu is currently available Monday to Friday until 9 April 2009. Approximate price – £24 for three courses from the set menu lunch, otherwise about £50 for three courses. Excludes drinks and service. Sounds like the red mullet was a highlight here. thanks for thios review. I was considering it for a birthday meal with my other half but then thought the summer would be a better time to go. Sounds like it isn’t quite living up to its pricing. yum yu yum seems delicious. You posted on my blog a little while ago, thanks for your comment. I like yours to, a thorough and well written review. I too had a similar disappointment when dining at Moro a year or so ago. Food was ok, but nothing very special at all, I have made better dinners at home with my Moro cookbook! Anyway, I’ll be sure to come back and read you again. Keep up the good work. River Cafe does seem to divide people into love or hate. Does the lunch special run on weekends as well? Seems a great bargain for such a renowned restaurant even if your meal did not live up to your expectations. thanks for coming to visit my blog. I hope you come again soon. Yes I agree, the River Cafe does seem to divide people. I thought the food was very good, but based on what I had, it didn’t live up to a Michelin star. The menu is indeed good value. It’s worth trying given the price and quality of the produce you get. It’s only available Monday through Friday. This is somewhere that i’ve always wanted to go too £24 is a bargain price, if only I lived nearby I’d be there in a flash! This looks delicious, I love a nice piece of fish. Not sure that I’ve ever had mullet before. Hmmm this is mildly disappointing. I’ve been meaning to go here since I moved to London 5 years ago so I was hoping this review would blow me away and I’d finally do it. But I find that the ‘big restaurants’ often have trouble living up to reputation, don’t they? The River Cafe is somewhere I’ve been meaning to try for the past 5 years and I somehow never get around to going… This review is kind of disappointing – I’m not sure if it’s truly worth the schlep across London now! Sigh… the ‘big restaurants’ often disappoint in some way, don’t they? Yes, I think a Michelin restaurant shouldn’t make mistakes. But £24 is good value for a three course lunch. You just have to manage your expectations. Hi there – interesting review. One thing if I may. The fire was limited to the kitchen and wasn’t really disastrous…! Yes, I suppose the fire didn’t burn the restaurant down, but it did have to close for a number of months. Can’t belive how much i love this blog! I must have commented on nearly all your articles now?